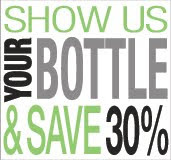 Lime Post: Show us your SIGG Bottle & Save 30%! In light of the recent revelation by SIGG that their water bottle liners contain Bisphenol-A (BPA), the hormone disrupting chemical the Canadian government has banned in baby bottles, we're offering you the chance to save 30% on our certified BPA-free Lakens and stainless steel Thinksports. Simply show us your bottle. Email us a photo of your SIGG bottle to at customerservice@lavishandlime.com and we'll send you a unique code for 30% OFF any of our BPA-free water bottles from European manufacturer, Laken. Laken water bottles are the only certified BPA-free lightweight aluminum bottles on the market. Or if you'd rather switch to non-leaching stainless steel, you can purchase our Thinksport bottles with the same code. If you're SIGG-less but would still like to buy a top quality, BPA-free bottle at a discount, just email us - with the subject line SIGG-LESS - and we'll send you a unique code for 20% OFF any of our close to 20 different bottles, all of which are good for you and the planet too! This is a limited time offer - until September 22nd only - as these are quality bottles that are rarely discounted to this extent. We've been lucky enough to get the manufacturers on board which is why we're able to offer you these discounts. Click here for more information. To get the full scoop on the SIGG situation, read this article at Babyvibe.ca and to confirm your bottle has the lining with BPA in it, compare your bottle with the pictures here. You can browse our selection of BPA-free reusable water bottles here. If you have any thoughts or ideas about BPA or water bottles in general, feel free to leave a comment below. We'd love to hear from you!